A wonderful combination of Western influence and Eastern ingenuity have created these special tea infusers that are essentially a handled tea infuser cup or tea mug that include a removable, self contained infuser. The tea cup with strainer is accompanied by a fitted lid that will prolong the temperature of your tea and your enjoyment of your favorite tea blend. At Mrs. Lin�s Kitchen, we have gathered an amazing collection of infuser mugs and infuser tea cups from manufacturers through out Asia for your enjoyment and you will be sure to find the perfect one for yourself or as a gift. 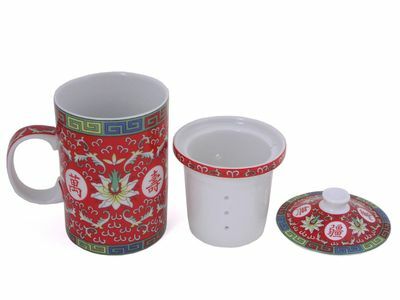 For the price conscious, we have a magnificent variety of Chinese porcelain tea infusers including the Longevity Chinese Symbol Green Infuser Tea Mugand the Multicolored Magnolia Mug that are just a small sample of the affordable and beautiful styles we carry. From Japan, we have selected some lovely porcelain tea infuser cup pieces that are representative of their culture and you can't go wrong with the choice of thePorcelain Japanese Lucky Cat/ Maneki Neko Tea Mug with Lid and Infuser or the Black Alloy Poem Mug that offers a moment of quiet contemplation as you sip your favorite blend.